Joining Team Washington for the 2016 season, Rob Eidson is the head coach at Redmond High School. 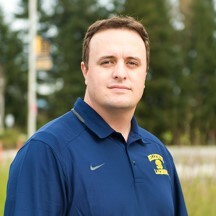 Prior to taking the lead at Redmond, Rob had coached in the Bellevue Boys Lacrosse program for three years as the BHS Junior Varsity Head Coach. Coach Eidson also concurrently served as Assistant Program Director, in which he worked with the youth program operations and recruitment of coaches. Originally from the Philadelphia area, Rob played varsity lacrosse at West Chester East Senior High School. He went on to play in the National College Lacrosse League (NCLL) at Mary Washington College (now the University of Mary Washington), where he was named to the NCLL All-Star team twice. Prior to moving to Washington he served as a head varsity coach in the Virginia Commonwealth League of Northern Virginia. Rob has no time for any hobbies and spends whatever free time he has with his wife Erin and three boys - Hunter (5), Colin (4) and Cameron (18 months).